It might sound absurd, but this is the kind of thing that people running nonprofit organizations hear all the time. Whether they are providing housing or preschool or vocational training services, social organizations typically find their funding restricted to specific programs, locations and time frames. That doesn’t make it easy to grow. That’s why even the best social organizations grow slowly compared with companies. As a result, very few nonprofits ever go national — and those that do take the better part of a century to get there. While things are improving for nonprofits in this regard, the situation is nowhere near as efficient as it is in the business sector, where successful companies like FedEx, Home Depot or Google can raise the money they need to build national or global operations in a decade or two. Nonprofit Finance Fund® (NFF®) makes millions of dollars in loans to nonprofits and pushes for fundamental improvement in how money is given and used in the sector. Since 1980, they’ve worked to connect money to mission effectively so that nonprofits can keep doing what they do so well. NFF envisions a world where capital and expertise come together to create a more just and vibrant society. NFF unlocks the potential of mission-driven organizations through tailored investments, strategic advice and transformative ideas. NFF’s strategy is to provide financial resources, in the form of loans, grants, and asset-building programs, in concert with management advice. 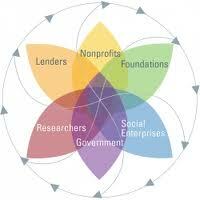 NFF works directly and with funders to strengthen these organizations and the system by which they are funded. Embrace a “whole enterprise” perspective in grantmaking, one that takes into account the viability of the organization and the role of the grant within it. Ensure that grantees have access to all the kinds of capital they need for success and sustainability, including loans and other alternative resouces to complement grant dollars. Incorporate a financial and economic context into grantmaking strategy. Access knowledge of the social capital market and financial resource needs in a geography or subsector. Times of crisis always expose our strengths and weaknesses — in all sectors and businesses. We rise to extraordinary challenges and falter in difficulties we’re unprepared to deal with. In our post-recession world, the still-growing demand for nonprofit services, depleting (or nonexistent) reserves, and funding cuts have sharpened the picture of our sector’s strengths and weaknesses. To rise above constantly changing economic conditions and maximize the social impact of money, we need to come up with innovative and flexible strategies to survive and thrive– right now and in the future. This is where NFF can help.